Marci is a very good cake maker and has learned to apply the Italian Meringue Buttercream in thin layers. When students come to my studio to learn to properly ice cakes or make white chocolate fondant, they are often surprised at how relatively easy it is to master certain techniques that will allow them to make wonderful cakes. For applying Italian meringue buttercream, apply it in thin layers and make sure the buttercream is somewhat soft. You can soften the buttercream in a few ways. I prefer to simply put the buttercream into a microwave oven for a few seconds to soften it up. You can dip a spatula into a container of hot water, wipe the spatula on a clean cloth and use that spatula on fresh buttercream to smooth it. Do not use a hot spatula on chilled buttercream because you will discolor it. Some people like using a flame as in a torch and that is a quick way to smooth buttercream when you use a bench scraper. The amount of buttercream that you will need to put on a cake is just enough so that you can no longer see the cake. It is not necessary to put a tremendous amount of buttercream on a cake, your customers will appreciate just enough and not too much. The turn table is perhaps the most essential of tools for icing cake. It is the rotation of the turn table that smooths the buttercream. As you move the table in one direction, you will bring your spatula towards you in the opposite direction always keeping the buttercream ahead of your spatula blade. Using a bench scraper is a good way to keep your sides straight as it is a perfect 90 degrees. 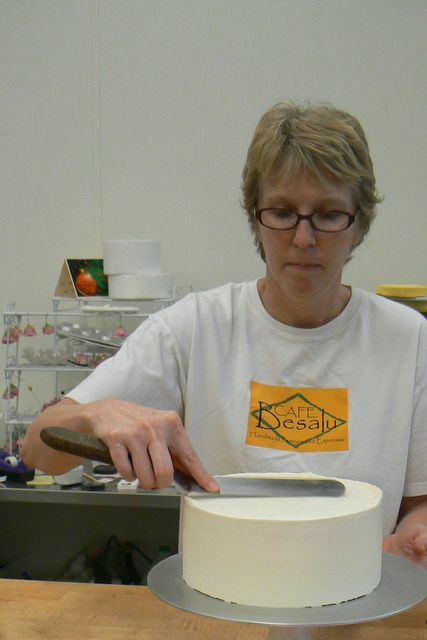 When you put your scraper against the side of the cake you can determine if your buttercream has been applied perfectly because you should not see daylight anywhere that bench scraper is held to the side of the cake. The ratio is always the same..1 pound butter per 4 ounces of egg white. Use pasteurized egg white for your cakes that are going to your customers just to be on the safe side. Pasteurized egg whites can be found in the grocery store egg section and are sometimes called Just Whites or something like that. You can get them in the quart size and half gallon size as you grow your business. The half gallon size will come frozen from some dairy distributors. Place 2 cups of granulated sugar into a saucepan with 1/2 cup cold water to moisten all the granules of sugar. Start whipping the egg whites in the bowl of a heavy duty mixer with a whip attachment. When the egg whites reach the soft peak stage, stabilize the whites with 1/2 cup of granulated sugar. Cook the sugar in the saucepan to 240 degrees F. and then carefully pour the hot sugar syrup over the stabilized egg whites. You are now making a meringue. Whip on high speed until the meringue is cooled. Add the unsalted butter and allow to whip an additional 5-10 minutes until the whole mixture is quite smooth. Add the vanilla extract and voila! You have Italian meringue buttercream. How easy is that. For those who tell you you can’t pipe Italian meringue buttercream, they are wrong. You can pipe with this lovely buttercream. It takes some practice but it can be done. My student, Samia has made a three tiered cake in her wedding cake workshop that is a combination of fondant and buttercream. The flowers were piped with Italian meringue buttercream as well as made with gumpaste. This was a mixed medium workshop! 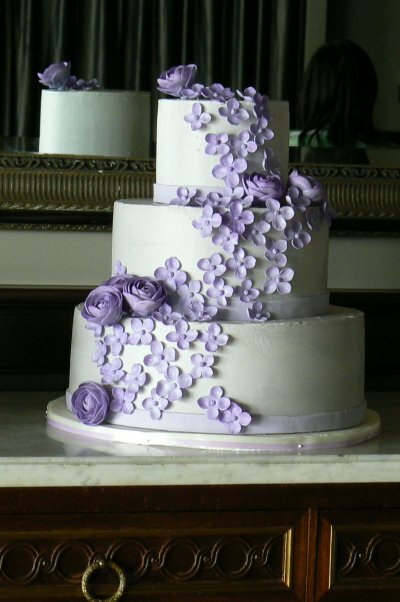 My good friend Dan Mikosz of Decadence Custom Cakes, worked in my studio for over 2 years. In 2010, Elizabeth was born and she often came to the studio with Dan. 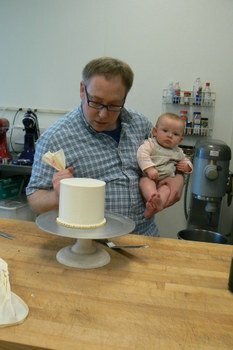 From the very beginning, she enjoyed watching the cake making processes. Elizabeth was the most observant little baby. She loved watching how everything was done. Preheat the oven to 350 degrees F. Prepare 3 8″ cake pans by spraying the bottom of the pan and lining it with an 8″ round of parchment paper. Sift together the flour with 2 ounces of the granulated sugar, the baking powder and the salt. Set aside. In the bowl of a heavy duty mixer with a whip attachment, place the egg yolks, the cold water, the vegetable oil and the pure vanilla extract or Madagascar Vanilla Bean Paste. Mix on medium speed for about a minute. Add the flour mixture to the yolks all at once and mix for an additional minute. Scrape down the bowl and continue to whip for a few seconds until you are sure there are no flour lumps in this mixture. In the bowl of another heavy duty mixer with a whip attachment, start whipping the egg whites which you will stabilize with the remainder of the granulated sugar which is 5 ounces. Stabilize the whites after they reach the soft peak stage to assure the greatest volume. Do not add the sugar too quickly to egg whites that you are stabilizing because the weight of the sugar can cause the whites to collapse. Take both bowls off their mixers, and fold the whites into the yolk mixture really well. Make sure there are no lumps of whites that are unincorporated. The total weight of the batter will be approximately 28 ounces so pour 9 ounces of batter into each of the cake pans and bake for about 20 minutes or until just golden. Cool in the cake pan and remove..the cakes should be completely chilled before filling. Here is a picture of Dan with Elizabeth while he is decorating a tiny anniversary cake in the studio in 2010. Elizabeth is two months old here and she is observing the cake making process. 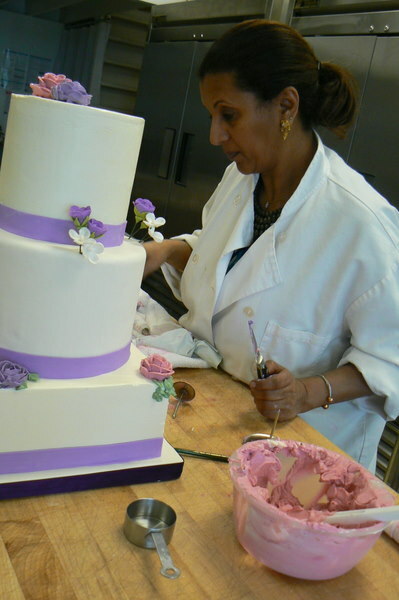 She always loved watching the cakes being made.